You really didn’t think it would all go so smoothly, did you? Hey, little announcement: I need an artist willing to draw some digital stick figure versions of the Supervillainous cast for a new project. I intend to turn my TWC vote incentive into a companion comic, updating weekly. After that, the comic goes into an archive and becomes an official part of SV. I don’t think anyone’s ever tried something like this, so why not give it a go, right? I’m afraid I can’t offer financial compensation, since even I don’t make money off this little comic. There’s a sample of what I’m looking for in the voting incentive this week. If you’re game for a fun little project with some extremely basic art duties, drop me a line at zappit1234 AT gmail DOT com. 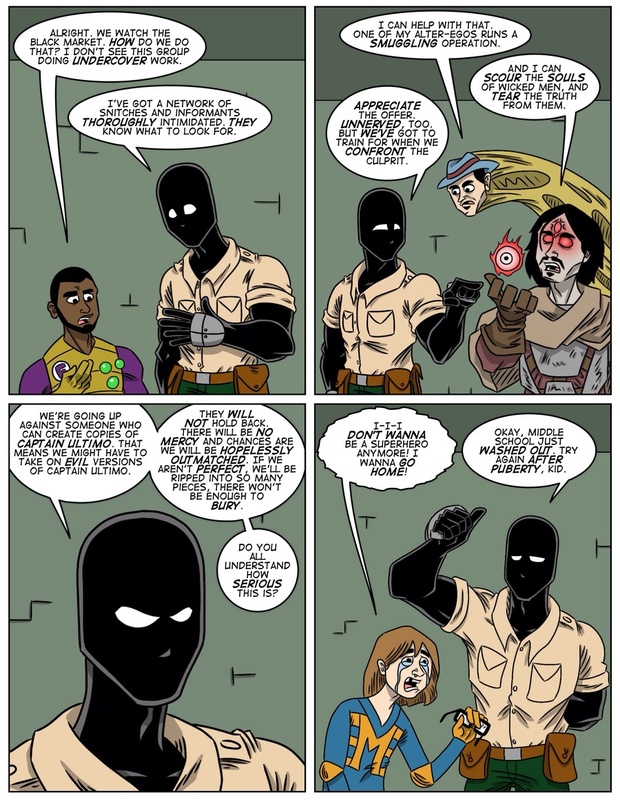 You can leave comments by clicking here, leave a trackback at http://supervillainous.spiderforest.com/comic/the-action-faction-part-5/trackback/ or subscibe to the RSS Comments Feed for this post. Welp, the Loser of the team has left. Sorry Trippitise. I’m not entirely sure that he was a superhero….what are the odds that the Actioneer just grabbed a random kid off the streets? He might’ve thought it would be funny? I assure you the Actioneer did not just grab some random kid and decide to make him a superhero. So what kind of person would the Actioneer just randomly grab of the street to make them a superhero? Funny, up until this point, you think the Actioneer is both incompetent and annoying, then you find out that while he’s certainly annoying, he’s just about as competent as the Crimson Claw. If you look back, you’ll see Actioneer considers insults, zingers and general annoyance to be “bullets” made specifically to drive opponents into a blind rage, which makes defeating them easier since they’re no longer fighting reasonably. Basically, he’s shown his competence, but has chosen to utilize it through being one of the most annoying people on the planet. Its the favored Method of Deadpool, The Doctor, Captain Jack Sparrow, occasionally Spiderman, Dr. McNinja, Bugs Buny, The (2nd) Blue Beatle and even the Annoying Orange so it’s been well proven. How DARE you mention that gorram cirtus on the same list as… well, as ANY of those guys?